More than 7 million and an estimated 17 million people in conflict-affected South Sudan and Yemen, respectively, are expected to be in Crisis (IPC Phase 3) or Emergency (IPC Phase 4) through September 2019. In addition, while many areas are expected to be in Crisis! (IPC Phase 3!) in the presence of food assistance. The risk of Famine (IPC Phase 5) persists, should there be sustained lack of access to livelihoods, markets, and humanitarian assistance, for isolated populations in parts of Jonglei, Lakes, and Upper Nile states. Famine (IPC Phase 5) would also be likely in Hajjah and Sa’ada governorates should trade disruptions in Al Hudaydah port occur, where populations are already facing extreme household food deficits and are cut off from humanitarian assistance. At least 7.1 million poor households are expected to experience food gaps or deplete livelihood assets in pastoral and agropastoral areas of Ethiopia, Kenya, and Somalia that experienced drought conditions and production deficits during the October to December rainy season. Widespread Crisis (IPC Phase 3) outcomes are expected in Ethiopia and Somalia and an elevated number of households in Crisis (IPC Phase 3) are likely in Kenya. In the absence of funded assistance from June to September, Guban Pastoral livelihood would deteriorate to Emergency (IPC Phase 4). Conflict-affected populations in Sudan are also likely to be in Crisis (IPC Phase 3) or Emergency (IPC Phase 4) through September, as access to humanitarian assistance and livelihoods remains constrained. At the time of publication, outlooks were based on seasonal forecast assumptions of average to above-average March to May rainfall. However, delayed and below-average rainfall in March in the greater Horn of Africa has resulted in a revised seasonal forecast of below-average to average rainfall. 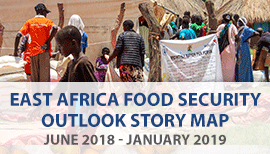 Two consecutive below-average production seasons would lead to rapid deterioration in food security for poor households and an early start to the next lean season. Should expected outcomes change, revised mapping will be available in April. About 12 million people were internally displaced in Burundi, Ethiopia, Somalia, Sudan, South Sudan, and Yemen by mid-March 2019. An additional 5.3 million refugees from these countries are in camps in Burundi, the DRC, Ethiopia, Kenya, Sudan, Uganda, and Tanzania. Most refugees are Stressed! (IPC 2! ), supported by humanitarian food assistance. However, potential pipeline breaks would likely lead to refugees falling into Crisis (IPC Phase 3). Internally displaced populations have limited capacities to access food and income and many are in Crisis (IPC Phase 3).